w i g w o t . c o m: Patriotism... Politically Incorrect? But also by the men it honors. I read this quote recently and it meant a lot to me. , it's idealogy, and the symbols that have made this nation great, is a man that JFK had in mind. I visit Indianapolis often. Love the city. Every time I pull off the highway the first sight that I see is an American flag. It is glorious. The red, white and blue against the beautiful sky, flapping gently in the wind. I am so proud of it, of what it stands for, and where it has been, the men who have carried it, and the men buried beneath it. My daughter and I stopped to find the owner and to say thank you. 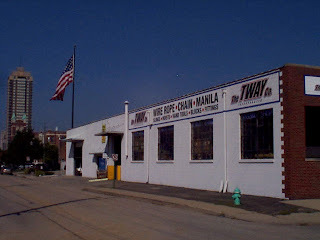 We pulled up to The TWAY Company, a supplier of industrial supplies and rigging equipment, in Indianapolis. An unlikely looking pair, and not needing any industrial rigging equipment, we timidly asked for the owner, not really knowing what to expect. Caitie and I met the president of TWAY, Peter Hansen. Peter was kind, and I'm sure a bit curious about why we had come to see him. We explained that we wanted to thank him for the flag, and let him know that although it was an expense, it was a wonderful, and appreciated gift he was giving to everyone that could see it. I learned a lesson that day. Peter was gracious and was obviously appreciative, but then he told us the rest of the story. Not everyone liked the flag. 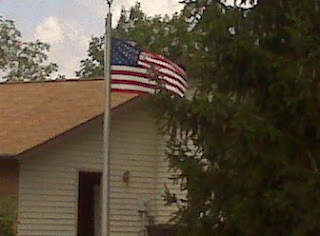 In fact, people from as far away as eight blocks were complaining about the American flag. People complained that it ruined their view, and they didn't want to see it. 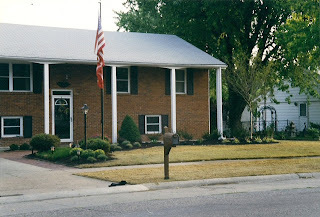 As it turns out, in this particular neighborhood, you can't even fly a flag in your own front yard, only in the backyard where no one else can see it. I was shocked. In my own little world, I just assumed that everyone felt the same way I did. 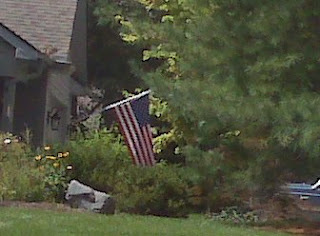 I had no idea that there was anywhere in America that you couldn't fly a flag in your own front yard. As it turns out, Peter had his work cut out for him to keep his flag. In fact when it came down to it, he was only allowed to keep it due to a loop hole in the zoning laws. Finally, he was issued a Certificate of Appropriateness to fly his flag. I'm sorry what was that...? How is it that an Certificate of Appropriateness has to be issued in order to fly an American flag, in America? This made me wonder, and question my assumptions about all the people around me, who I assumed felt the same that I did. 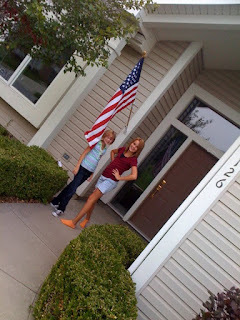 Basic things, like honoring, respecting, our country's flag. I know that I'm not alone, but have I slipped into some small minority that values things like this. Am I part of a patriotic minority? The question scares me. What kind of men is this nation producing, honoring, remembering? When did it become politically incorrect to be patriotic? Peter, thank you for standing your ground. Thank you for serving your country, and investing your time, effort, money and energy into keeping the stars and stripes flying, and relevant to the community. Thank you for being part of the minority that wants to cherish and preserve what our country stands for. Thank you for being a hero to me, and a role model for my girls. Next time you're out and about, look around, maybe you'll notice a flag that someone like Peter has fought for the right to fly, or maybe what you'll notice are the flags you don't see, they are everywhere. Our new flag, as of 8:00 pm tonight! 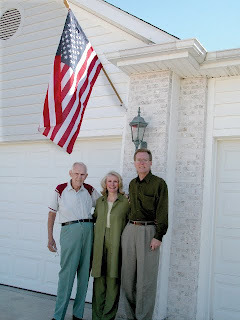 Dennis & Donna Emley, and Donna's dad. She referred to him as "proud American, proud Marine". Marika, YOU are NOT alone. Thank you for this article, and for sharing your heart with us. You are unbelievable, a citizen role model for all, and a role model to parents everywhere. Your daughters are fortunate! I will pass your article on to my list. Thank You. the 3rd home that I have set it in cement, and dug it back out and brought it to a new house when we moved. When we move next, I will do the same again! Wherever I go I will always bring this flag pole with me. By the way, I got a great deal on it from a flag pole mfg in my home town of Kenton, Ohio and bought it for like $350 after I got out of college, and when I didn’t have two nickels to my name. Marika, as a Canadian, we are inherently less flag-waving and patriotic as our fine neighbors to the south, but despite that, I can understand and appreciate your love for this most important symbol. Too many people feel that waving "my flag" is a diss against somebody else's, and once again, we let the moans of a few overshadow the passions of the many. 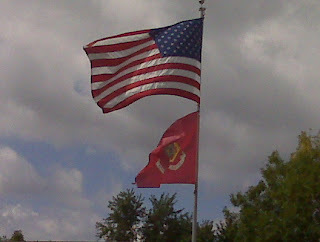 But even if there are restrictions against where a flag can wave, there are none on how they can be displayed, i.e. worn as a jean-jacket patch, as a t-shirt, as a lunch-box sticker. If the stars-and-stripes belonged to a football team there'd be no problem. Maybe those who want can just join "Team America" and show their colors in hundreds of different ways. This is in response to Andy...there ARE regulations governing display of the United States Flag. See the Flag Code. The only problem is that there are NO PENALTIES for misuse of the flag. The Code lists dates the flag should be flown (if not being flown everyday), gives times (sunrise to sunset - unless lit), how to hoist and lower (briskly and ceremoniously, respectively), the Code goes into great detail explaining exactly how the Flag should be placed and displayed in various circumstances. It specifically states that the Flag should not be worn, and also states that no part of the Flag should ever be used as a costume or athletic uniform. I found the Code after coming home from this years Three Rivers Parade. I was very upset that a group had defaced the Flag in the Parade and no one seemed to care or notice. The group had various signs and sayings on our Flag. Such as a peace sign where the Union is and spray painting a message across the stripes on others. The Code states that the Flag should never have placed upon it, nor on any part of it, nor attached to it any mark, insignia, letter, word, figure, design, picture or drawing of any nature. 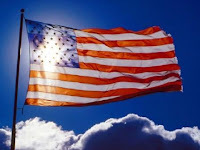 The flag should be treated with reverance and if it is damaged or is in any condition that makes it no longer a fitting emblem for display, then it should be destroyed in a dignified way. The VFW has burning ceremonies to retire flags and also the Boy Scouts have a ceremony every year that they retire flags. The problem I have is that the Flag Code is not a well known regulation - unless you are in the military (or married to someone who is or was) then most people don't know the rules. Thanks for the education Lynn. I had no idea and I'm grateful that you have taken to time to share this. It makes me wonder why this isn't taught in school...? I guess I don't wonder that much as it is so difficult even to continue the tradition of reciting the Pledge of Allegiance.